Batman folding knife with twin razor sharp stainless 440 blades. Item has black finished ABS handle shaped like a Batman logo and imprinted with a silver Batman logo on it. 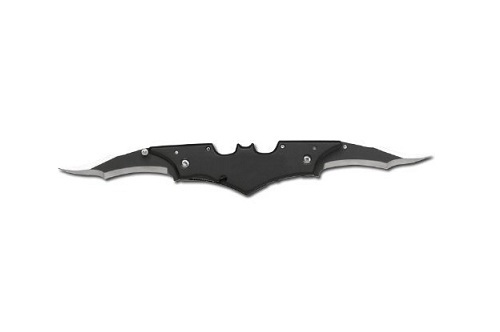 When folded, this knife has a shape of Batman's batarang. The twin blades are black finished except the edge portion, and they have liner lock mechanism and thumb studs. The batman knife comes with a belt clip. The knife is measured at 5-3/4" when blades are closed, and 11" with blades open. The item comes with the original gift box..